It's impossible to avoid college hoops hype when living in the USA. ESPN covers it obsessively and rather than ignore it, I've decided to learn more about it. So when I travelled to North Carolina to complete my NHL venues, I looked for nearby games, only to realize that the season had already ended. Instead, teams were playing in conference tournaments over Championship Weekend. 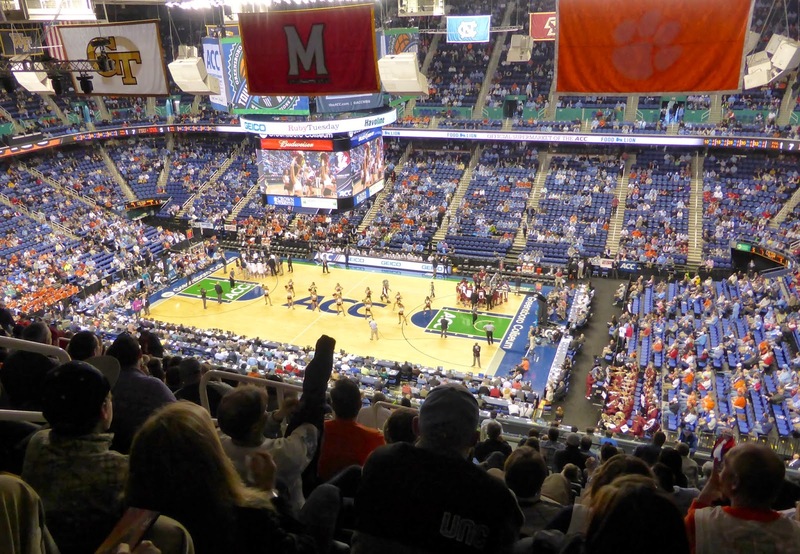 Fortunately, the ACC was holding their tourney in Greensboro, just an hour away from Raleigh. I thought the four games of the quarterfinals would be worth attending until I found out that you needed to buy two separate admissions: one for the first two games and one for the second pair. Tickets are not cheap, so I decided to attend the afternoon session only and spend the evening enjoying a nice dinner with my friends in Raleigh. On Friday morning, Sharpy and I drove the hour to Greensboro, arriving at 11:15 for the 12 pm tip. Tickets had dropped to $20 on StubHub but their pickup office was not convenient to the Greensboro Coliseum (above), so we had to barter with the friendly neighbourhood scalpers, of which there were many. I offered $20 for some uppers to many of these businessmen, but they weren't so friendly after all. The problem was that the North Carolina Tar Heels were playing in the second game and the scalpers were holding on to their tickets for that, as they expected an influx of fans making the drive from Chapel Hill. I finally found a gentleman willing to negotiate and we acquired two tickets for $35 each, just over half the $60 face value. The Greensboro Coliseum is huge, with a seating capacity of 23,500 (little-known fact: when the Carolina Hurricanes played here from 1997-99, it was the largest arena in the NHL). Most of these seats are in the upper deck though, with 28 rows in each section, from A to BBB. We were in row W, far away but OK with binoculars. Their were 8 teams playing during the day, but the Wake Forest Demon Deacons were not one of them. 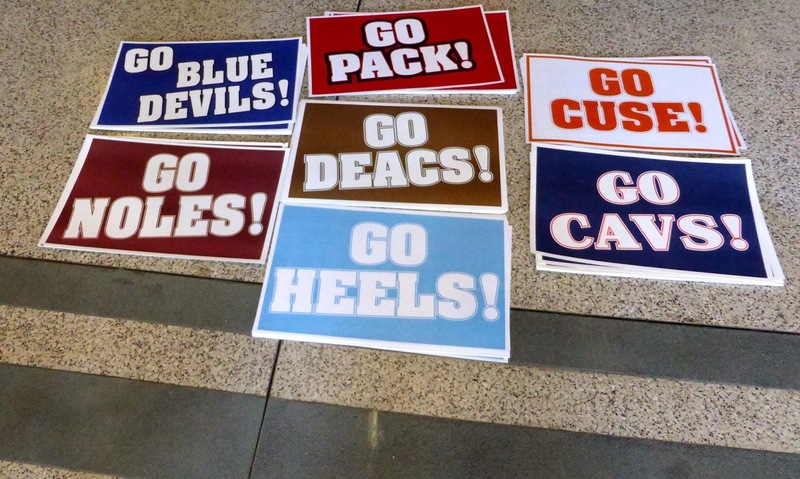 Still, their cheering signs were available for just $1, along with 6 others. The afternoon games featured #1 seed Virginia against #9 Florida State, while #4 North Carolina played #5 Pittsburgh (who were being ignored in the sign competition). The lower concourse is relatively narrow and food lineups can be quite long, especially during half time and between games. Still it is worth walking around as there are a couple of displays illustrating a number of historic events that have taken place here, including those first two Hurricane seasons as well as several minor league hockey seasons. The upper concourse has nothing worth seeing but is less crowded if you need to get somewhere quickly. Food options are plentiful and varied, with BBQ sandwiches quite popular. The Greensboro Coliseum could easily host a professional team but the area's urban population of 312,000 is just 120th in the nation, not enough to maintain a long-term following. It is one of those places that you'll probably never consider for a sports road trip but I would urge you to find a reason to visit; it is one of those places that flies under the radar but offers a unique experience for the stadium traveller. 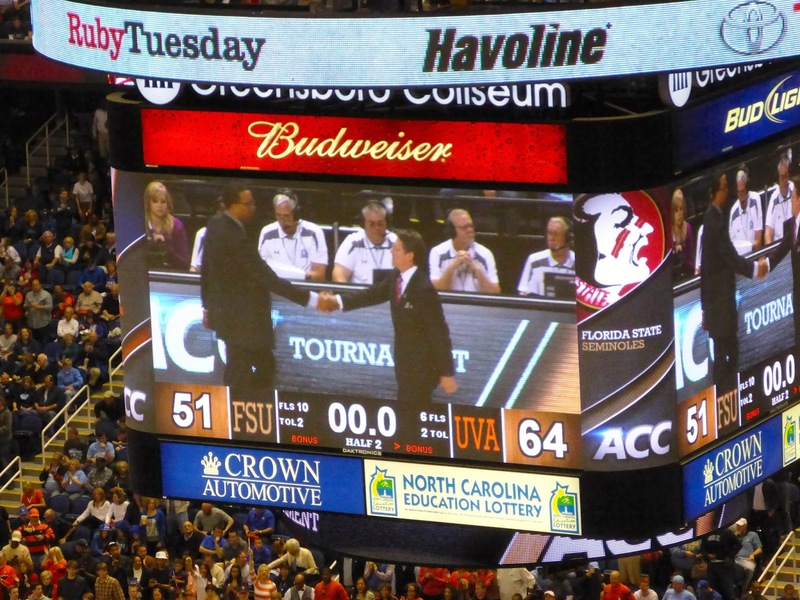 The first game was pretty routine, with Virginia clearly better than Florida State. 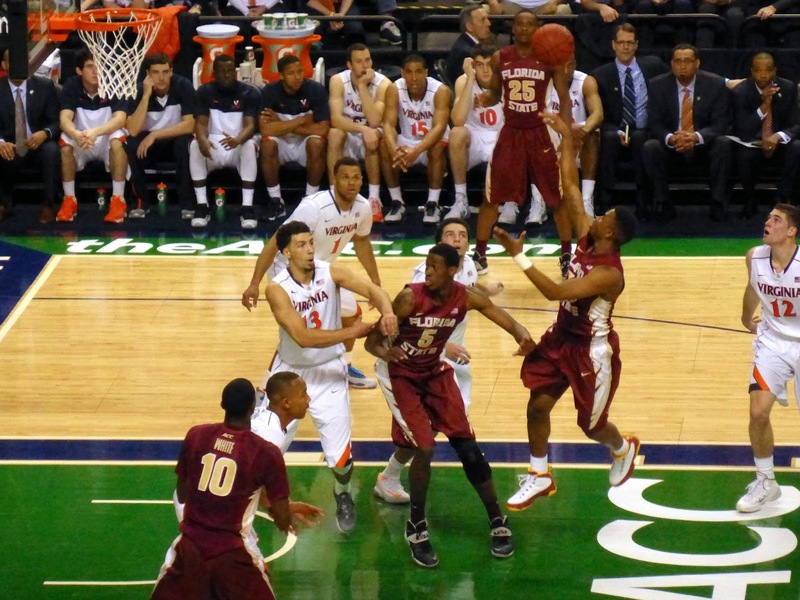 Near the end of the first half, I made my way downstairs and managed to catch the Seminoles scoring a running jumper. The highlight here might have been the Seminole cheerleaders, who maintained a healthy optimism despite their team losing their chance at making the NCAA tournament. The Cavaliers led 32-27 at the half and pretty much replicated that effort in the second stanza, taking it 32-24 for an easy 64-51 win. Florida State are now considered as one of the "first four out" so it looks like their chances of dancing were ended with this game. After a 20-minute break during which thousands of UNC fans filled out the arena, the Panthers and Tar Heels took the floor. North Carolina was just brutal early on, missing nearly every shot as Pitt built a 25-8 lead by the third media timeout. The star was Talib Zanna (#42 below), a 5th-year senior from Nigeria who grabbed an incredible 21 rebounds on the afternoon, including 10 on the offensive glass. 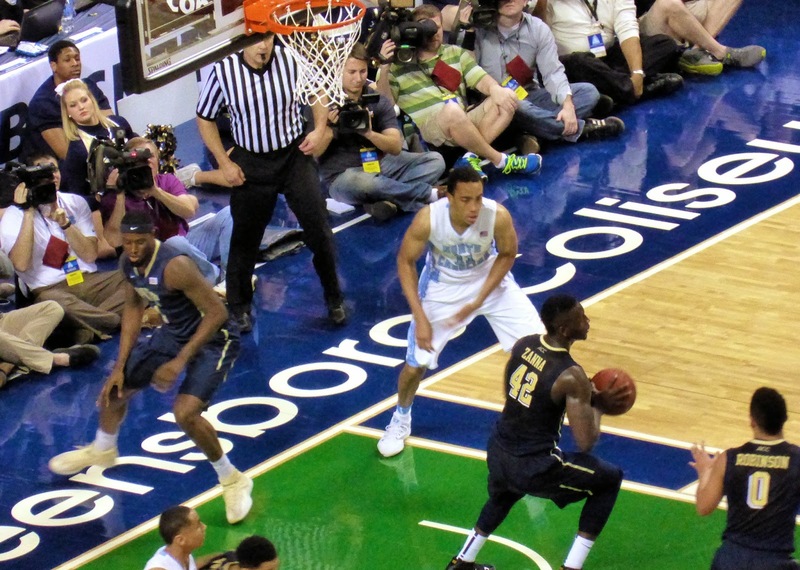 Pittsburgh retained their huge lead into the second half, up 57-38 with just 8 minutes to go. 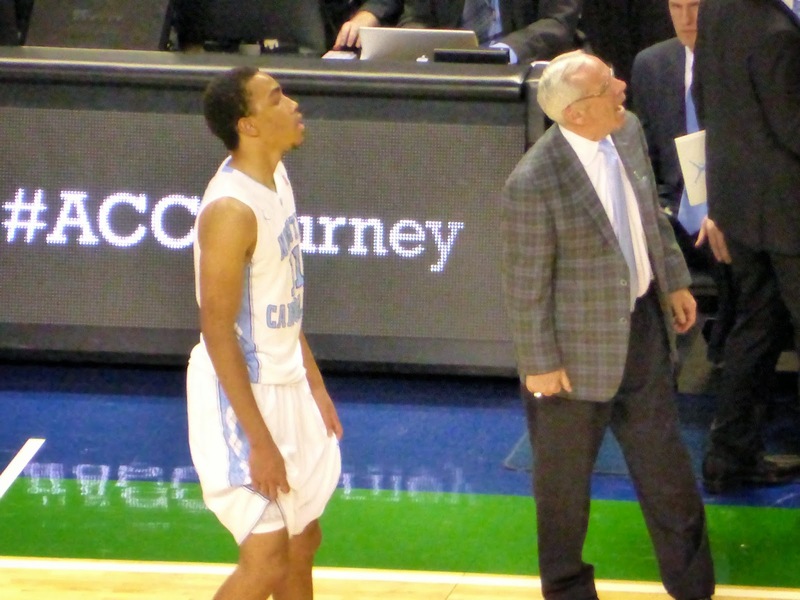 Then North Carolina started the full-court press and the Panthers crumbled under the pressure. At the final media timeout, the lead had only shrunk four points to 70-57, but then UNC went on a 14-5 run to get within four points with a minute left. 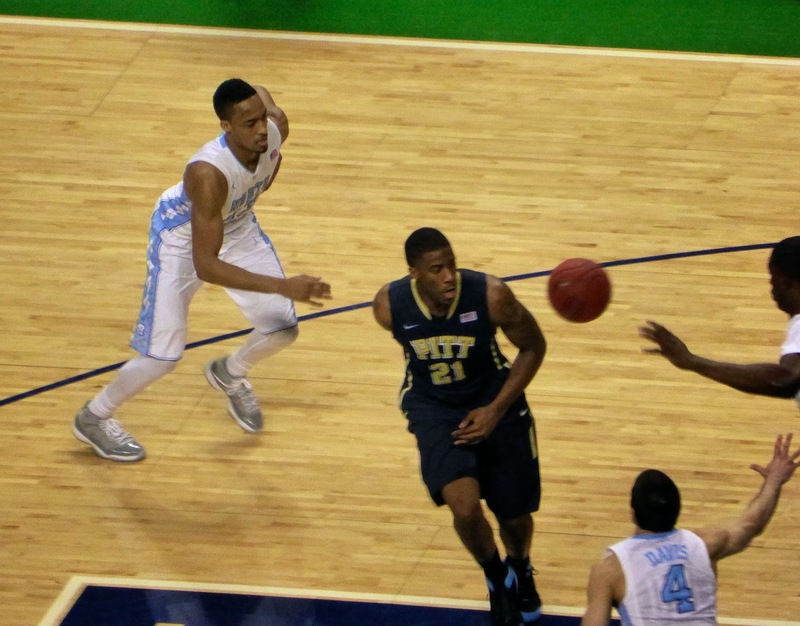 It was distressing to watch as Pittsburgh committed six turnovers due to the press over that time, but in the end the Tar Heels ran out of clock, unable to get closer than four and losing 80-75. Amazing that they scored just 38 points in 32 minutes, and then 37 in the final 8. Basketball rules are designed to allow teams that are losing to get back into the game, which is good for hype but bad for those who like a game to be consistent from start to finish. Ultimately though, the story in this game though was fouls. There were 56 infractions called as the referees seemed to be trying to get famous since the game was televised on ESPN2. Think about that. In a 40-minute game that had 8 media timeouts and 7 team timeouts taken out of 10, the whistle blew every 43 seconds on average for a foul. Four players fouled out, including Zanna and three Tar Heel starters. Coach Roy Williams (below on the right) was not impressed as you might be able to tell from his red face. He wasn't the only one; I sat in my seat exasperated at having the game ruined by the refs. With all the fouls, the game took about 2:30, just a terrible slog with horrible officiating. I realize now that the power conferences are not that interesting; it is the mid-majors where the sport is more accessible. TV ruins most sports for those in attendance with endless commercial breaks, but when a college hoops game is not covered, it can be completed in 1:45. ESPN won't tell you that though as they want more commercials and you can't argue against that. They have done a brilliant job convincing the average American sports fan that college basketball is thrilling even when most games are whistlefests. Overall, I'm glad I went but both games were pretty dull. Next year I'll try to check out some of the lesser lights in their conference tournaments instead. 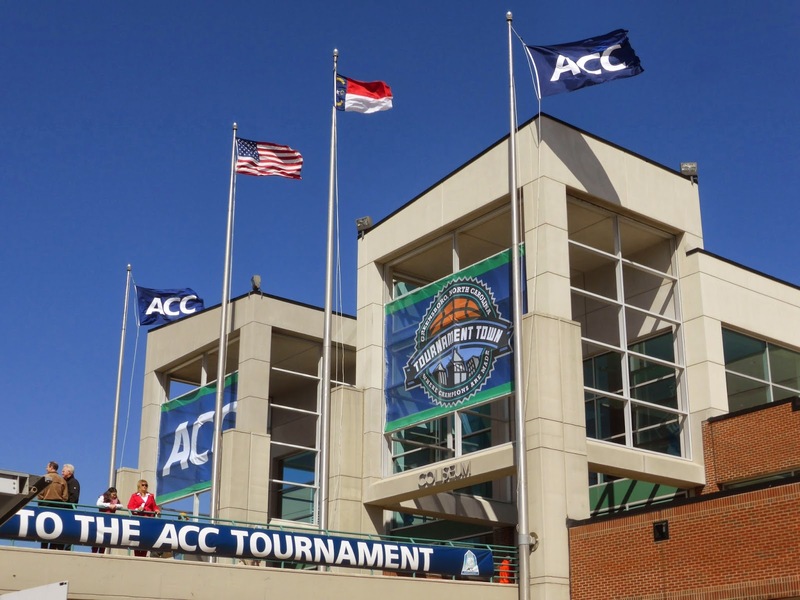 Next year will be the last that the tournament is held in Greensboro as the ACC chases big city money, moving the 2016 contest to the Verizon Center in Washington and the 2017 and 2018 to the Barclays Center in Brooklyn. If you haven't been to Greensboro, consider a visit next March as the Coliseum is a treasure that gets little publicity.